Born and raised in Toronto, Karen graduated from the Ontario Veterinary College in 2004. She was welcomed as a member of the Stirling Veterinary team in 2005. Karen thoroughly enjoys the challenges of general practice and the diversity that makes each day different. Also interested in international veterinary outreach, she volunteered her services for the animal relief efforts in New Orleans for 3 weeks following the devastation caused by hurricane Katrina – an experience she describes as heart-breaking but very satisfying. Her computer skills enables the clinic to keep up to date on current technological information. This knowledge benefits both the function of the office and the level of patient care. Karen is a member of the College of Veterinarians of Ontario, Ontario Veterinary Medical Association and is a current member and past president of the Quinte District Veterinary Association. 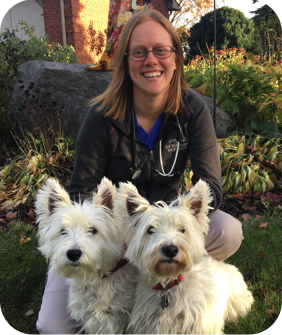 Outside of veterinary medicine, she is an outdoor enthusiast, enjoying activities such as hiking, soccer, ultimate frisbee and kayaking and she is always kept on her toes with her furry rug rats, Abby and Holly!